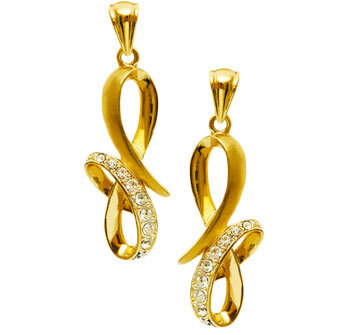 The most used precious metals in jewelery are: GOLD, PLATINUM and SILVER. When you think to gold you think to luster, color and rarity. Gold is exciting to the eye, for this many people are attracted and excited by his color. Gold is shiny and highly malleable, means is highly workable and resistant to corrosion, turnish and rust. But, the color of gold is determined by the type of metals it is alloyed with. Alloying gold increase it's hardness, tensile strenght, make it less expensive and make jewellery durable. Usually it is alloyed with a single or a mix of metals such copper, silver, nickel, palladium. The unit of measure to state gold fineness is KARAT ( K ) and is based on parts out of 24. Platinum is one of the most precious metals, the rarest and purest metal. 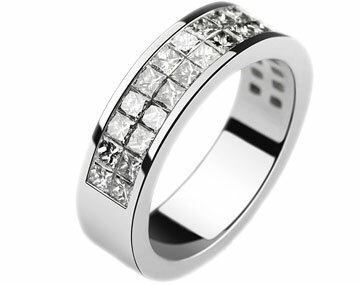 Platinum it is resistent to tarnish and takes high polish. It will never fade in color and will last forever. Platinum it's harder to scratch the gold and silver. His density gives it strenght and make it the most secure metal to set a diamond in. For this reason is one of the most popular choices for jewelers to use it in diamond rings. Platinum rates 900 - 90% or 950 - 95% on the fineness scale - means that is 90% or 95% PURE PLATINUM and the other 10% or 5% parts in a platinum alloy are irridium, ruthenium or another platinum group metal. The silver it is another precious metal used in jewelry. 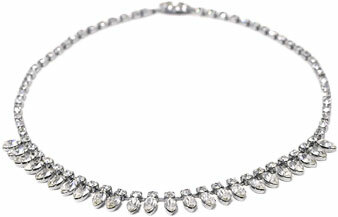 His principal assets for using it in jewelry are his workability, shine and bright. Silver is aproximatly half as dense as either platinum or gold. As pure silver it is too soft , it's usually mixed with a small amount of copper. The most popular silver alloy is STERLING SILVER - consists of 925 parts silver and 75 parts copper ( 92.5% silver and 7.5% copper).